Many believe the greatest threat to the United States is ISIS. Others say Climate Change. Recently you’ve probably read more about people freaking out about clowns. Scary clowns. Creepy clowns. I don’t get this fad. I don’t think anyone does. I think a news organization needs to find a clown and interview him to find out what’s going on. The clown panic has reached a point that McDonald’s is keeping their mascot, Ronald McDonald, out of their publicity until this clown fear passes. I don’t think anyone’s going to miss Ronald. He spends way too much time with little kids. If I’m confused about this then how confused can people outside the U.S. be when they hear we have a clown epidemic? 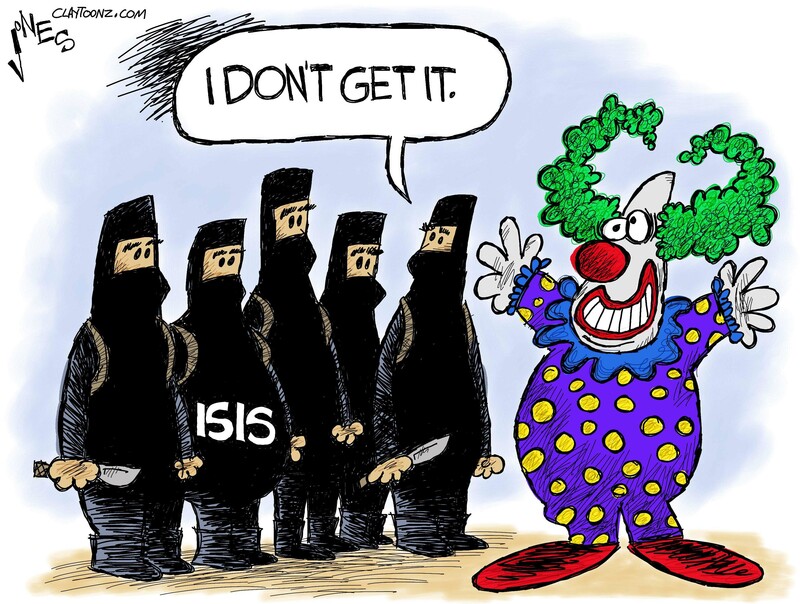 Will ISIS start recruiting clowns? Will this embolden terrorists when they see it doesn’t take much to send us into a panic? I wanted to take a break from the election for at least a minute, unless Mayor McCheese gets impeached for supporting creepy Ronald.